Libraries I (Diliman) – Bombard the Headquarters! CCP Documents of the GPCR. The Marx-Engels Complete Works at the Third World Studies Center. College of Mass Communication library. Ang Bayan archives at the Main Library basement. Filipiniana section of the College of Education library. Engels and Lenin on dialectics and materialism from the School of Economics. The library fee takes a significant portion of the school fees we’re paying in graduate school. This is the biggest reason for my trying to fully maximize the benefits of the university library apart from me just being me – a voracious reader and hoarder of books. This is with the exception of the reference books though which you can only borrow overnight and impose stiff penalties when returned late. 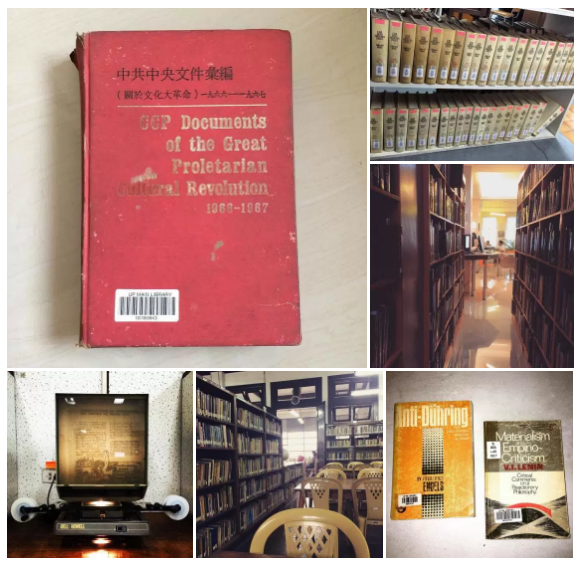 Main library for the Filipiniana, periodicals, social sciences and philosophy books, theses and dissertations, and a radical Filipino papers archive from the 1960s-1980s. Third World Studies Center for the large collection of Marxist books, including the Marx-Engels Collected Works, Lenin Collected Works, and Stalin Collected Works! College of Arts and Letters for literary works from around the world and language studies even if a lot of classic theory are missing! College of Mass Communication for being a treasure trove on works on cultural and media studies. College of Education for the Filipiniana books that, unlike in main library, you can browse for yourself. School of Economics for some Marxist books that nobody else ever borrowed since the 1980s and 1990s! Asian Center for a lot of history books, especially on Asia. Lots of stuff on Mao-era and post-Mao China too. Jose F. Lacaba’s Sa daigdig ng kontradiksyon: mga saling-wika (CSWCD). I need to go to the libraries again! There are surprising and interesting finds at the Filipiniana. You can enter the section and browse the books yourself if you’re a faculty member (or ask the help of one). Do they still have card catalogs inside the books? They give you a curious take on who reads what. The CAL library now is ugly. The second floor of the Main Library was its home for decades before transfer. Try to visit the Archives, as well. And the Serials section (does it still exist?). During my undergrad years, I would scour the libraries for books and a certain person named RC Asa would check my finds whenever I bump into him and smell each and every book, aside from checking the intro and biblio. The Main Library has a lot of unused spaces. Hopefully, they would utilize them so that scholars can have a comfortable “home” in the campus. Yes, they still do the card catalogs inside the books. So does the Serials and Archives. I’ve seen a certain person named JPaul too in some of the books too! I’ve always wanted to scour the Filipiniana collections myself. And indeed, I’ve always wondered why they don’t put all the libraries in one place and save on staffing, make looking for books more convenient. Third World Studies for example is now open only in the afternoon because of lack of staff.